Using a template is one of the best ways to get past "blank-page syndrome". Click the DESIGNS button on the right side button menu. Use the drop down menu to select a template design category. 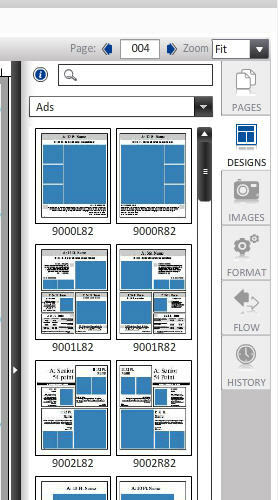 Your saved templates can be found in the Custom/ My Templates category. Drag and drop it on your page. TIP: Once on your page, the template layout can be modified to fit your needs. Do you like what you see? Save your template so it's reusable this year (and next year). From your File menu click Save As Template.